I try to avoid talking about the technical aspects of the site, but I have some news to share. I spend many hours a week on the site, but they are changes that you will never see or know about. The result of the hard work I put into the site is reflected in the speed of the searching over the growing millions of items in the database. It is also reflected in the site's reliability and very low downtime rates. My goals is always a 100% A+ user experience for my members. Email Alerts - manage searches and emails that alert you to new items as they are added to the Patchtrends.com database; searches will also be integrated with the live eBay auction database, Patchbazaar.com. This feature is about 85% complete, and I am shooting to release it by the end of September. Automatic item classification - this feature is more of a backend change, but the main value added here is that as new items are added to the Patchtrends.com database, I will have a system that automatically classifies them into simplified tags using a variety of heuristics. For example, all items that are related to cancer or cause awareness will be tagged with the "cancer" or/and "awareness" flag. Real aggregate data and statistical information - there has been a great need for some to aggregate the results of a search into statistics. I plan building up the capabilities of Patchtrends.com to provide aggregate (min, max, average, variance, etc) information. I also plan on providing charting capabilities that would allow one to view moving averages and compare metrics for one set of results against other sets of results over the same time period. This will make the "trends" in Patchtrends.com a reality. Personal list builder - this feature is one that I think people will really like; the idea is that you will be able to "save" results into specific buckets. You will also be able to add your own categories and labels. The net result is that you will be able to build and maintain your own list of items. I also plan on making these lists exportable, so that they can be useful for individuals doing research for their own person or guide or for guide authors who might happen to be working with Patchtrends.com to publish their own guide. I have few other hairbrained ideas floating around, but all of these are list above are the results of real feedback that my members have given me. And still after all of this has been delivered, there will be no increase in price for existing subscriptions. It's becoming clear that joining Patchtrends.com NOW is going to pay off in the long run. On August 22-23, Patchtrends.com attended its first Trade-O-Ree. It was located in Houston, Texas and held at the Sam Houston Area Council. It was hosted by Colonneh Lodge. The Patchtrends.com table was about as non-traditional as one could expect at a TOR. I was not selling patches, but I had some of my dupes out so that people didn't pass me up thinking it was an admin table. I had a couple of computers set up so that dealers, vendors, and attendees could sit down to look up prices. I had plenty of visitors and I appreciated meeting everyone. The most exciting aspect of the TOR was that I got to finally meet, face-to-face, so many great individuals that I have been knowing over the years from my dealings on the Internet. And, not surprisingly, they were just as great and nice in person as they are online. The first night of the TOR was relatively slow. There was very little foot traffic that was not a result of the vendors and dealers seeing what each other had. I made it a point to visit each table and talk to the purveyor for a while. They all had very cool stuff and interesting stories to tell. Of course I introduced myself and told them a little about Patchtrends.com. 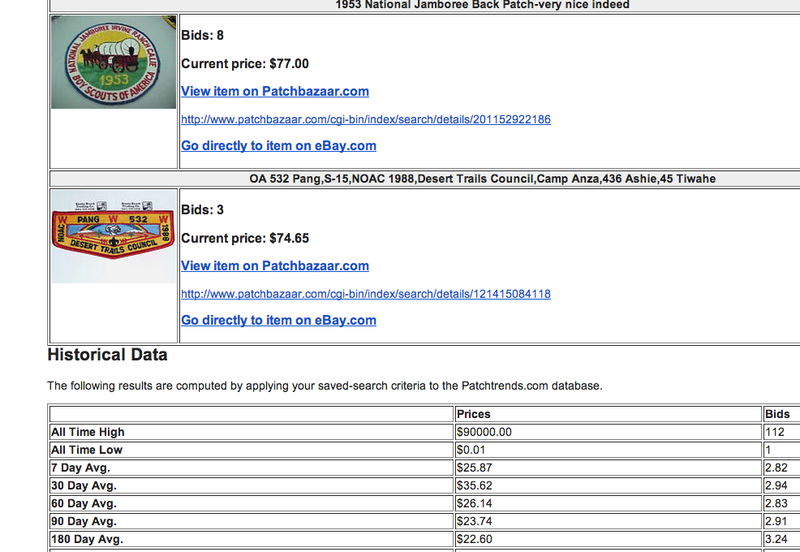 I also told them about the larger and growing Scout Patch Buyers/Sellers Facebook group that I manage. It's a great place for small time and big time sellers to sell. It's a great place for casual and serious buyers to also visit. As of current count, we have over 1,300 members. My greatest joy during the TOR was when I was able to discuss the site with individuals. Many took up the opportunity to use the site on one of the two laptops that I had open to Patchtrends.com. In particular, I wanted to make sure that each and every Scout I saw in the place had a chance to test drive the site. They were also made well aware of the fact that I provide youth Scouts with free accounts. A great time was had by all, and I am definitely hooked on this TOR thing now. I can't wait until I am able to attend the next one. I met a lot of great people and really appreciated the opportunity I had to spread the word about Patchtrends.com. But I keep going back to the real reason I had such a great time - the people. You never know who you're going to run into, and in my case I had the amazing chance to meet a fellow former Lodge Chief of Chilantakoba #397 - albeit our tenures were separated by a span of 30 years. It is my goal to make strong inroads into the many TORs that happen each year in this Country. I certainly can't attend all of them, but I am going to try very hard to make the ones within driving distance for me in the coming year. Since I am located in Houston, these would include: The Lonestar TOR (Grapevine), The Capitol TOR (Austin), and the world famous Dallas TOR. Patchtrends.com is a labor of love, and I hope that you consider joining if you are not already a member. My focus on customer satisfaction is bar-none in this hobby, and I really want a chance to provide you with an exceptional experience and a great product. If you are interested in joining, please visit. Once a member, you have all rights and accesses as everyone else. There are no tiers and no classes. All members are equal and all members are a priority.